I recently had a busy week away from home in Adelaide and Mildura, related to my work. Any thoughts of a little spare time between organised sessions at either venue were largely folly. In Adelaide, there was a significant distraction occurring just outside the Convention Centre – the Tasting Australia event was in full swing, with a variety of food, wine and beer on offer for purchase or some free tastings. Strolling back to the next conference session after a break, I was accosted by David VK5KK – a delightful encounter, as we had not met in person for a couple of years. The meeting was brief, but pleasant. A few days later, I was quietly investigating the local tourist information centre in Mildura when I hear a voice from behind: “Don’t I know you? KYF.” It was Gary VK3KYF, President of the Sunraysia Radio Group Inc. We had met previously – both Gary and Noel VK3FI had attended a GippsTech conference. The result of this encounter was a pleasant evening spent with Gary, Noel and their wives over some excellent food and wine at one of the local restaurants. On page 7 in this issue you will ﬁnd an “Over to You” item received following the publication of the review of the IC756 Pro III (August AR). Whilst I do not agree with some of the comments/ assessments made by the author, Brian does have some valid points that are worth clariﬁcation. Conducting thorough reviews of all aspects of any items of equipment considered requires considerable time and access to resources, especially sophisticated test equipment and experienced personnel to conduct the tests. The Publications Committee (PubCom) discussed the conduct of reviews approximately twelve months ago. Given that all activities of the PubCom are undertaken by volunteers, it needed to consider not just any ﬁnancial costs but also the time costs of conducting equipment reviews – readers must appreciate that most functions of the WIA are undertaken by volunteers, rather than paid staff. We are not like the ARRL, who have a sufﬁciently large membership to employ appropriate staff and have a well equipped test laboratory. The WIA simply does not have such resources. However, it does endeavour to act in a professional manner. To undertake an “objective” review of a typical item of amateur equipment against manufacturer’s specifications would take considerable time, delaying publication of any report. The experience of the entire PubCom membership of recent years has been that almost all commercially manufactured equipment has met, within close limits, the manufacturer’s specifications. The challenge always is to accurately perform the measurements! Furthermore, it was the collective opinion of PubCom that it was most likely that an item not meeting speciﬁcation was a faulty item, rather than reﬂecting exaggerated claims by the manufacturer. Therefore, PubCom decided that we would not routinely attempt to undertake such objective testing. We decided that most readers would be happy to have reviews that gave perceptions of equipment performance and characteristics, with the reviews undertaken by experienced amateurs. If the item for review did not appear to meet expectations, we could take one of two steps: undertake further tests and/or liaise with the equipment supplier. In all cases, we allow the supplier to comment on the review prior to publication, without any commitment to altering the review text. In the event of the review author/s and the supplier disagreeing, we will publish any comments from the supplier/manufacturer together with the review. With regard to Brian’s comment on the magazine layout, he is welcome to his views. Detailed layout is determined primarily by our publication house, based on the raw material that we supply, with feedback by the PubCom prooﬁng team. Most individuals will often have their own personal view, but the team decides if the supplied material is acceptable. Again – most of us are simply enthusiastic volunteers, not professionals in the publishing realm. I trust that the majority of readers ﬁnd these approaches acceptable – comments are welcome. Page 33 - The Point Perpendicular Lighthouse Weekend 2007 Ross Masterson VK2VVV. Page 35 - An enlightening trip to the Williamstown Lighthouse and Time Ball Tower Joe Chakravartti VK3FJBC. Page 11 - Charging single small cells with solar energy Grant McDuling VK4JAZ. Page 24 - More mysterious antenna faults! Felix Scerri VK3FUQ. Graham outlines the use of some readily available software tools to work some DX, despite the low sunspot number. "Now it's time for some serious talking to the doom and gloom whingers in language that they'll understand...... The bands are not dead....The bands are not dead....The bands are not dead." Graham's article is available for download - see the link at the bottom of the page. 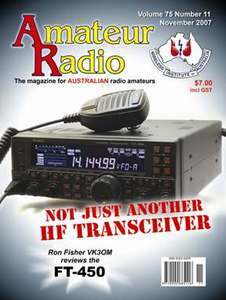 Rather than list them separately, I will simply note that we have several articles in this issue that report on activations of Lighthouses by amateurs around Australia for the ILLW event back in August. Ron describes a simple, easy to make, folding tripod antenna support base, together with an outline of tapped base coil vertical whip. A very easy system for portable operation on HF. This article is available for download - see the link at the bottom of the page. Reg describes a way to make simple but useful printed circuit boards, even if only a "one off" is required.